From the Old Town, facing Charles Bridge (Karluv most) and the river, turn left into Smetanovo nabrezi street. Go through the tunnel, then turn immediately right on to Novotneho lavka. Lavka is 50 metres along on the right-hand side. Lavka is made for al fresco drinking. On a warm summer's night, the riverside terrace at the rear of Lavka is one of the best locations in Prague for a drink with friends. 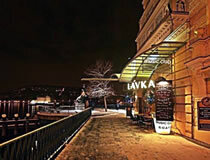 Lavka is situated next to Charles Bridge, on the Old Town side of the Vltava River. Its rear terrace stretches for 30 metres alongside the river, and offers stunning views of the bridge and over the water. Then look up, and Prague Castle sits majestically on the hillside above. This supreme location attracts a tourist-heavy crowd, the atmosphere is warm and convivial, with drinks served from an outside bar. There is a second smaller terrace at the front of Lavka, which is open all year round. It offers similar views over the river, and has heaters by the tables, providing much needed warmth in the winter. Inside Lavka, there is a bar on the ground floor and a club in the basement. When these areas are open, as they always were in years past, the atmosphere is grand, the drinks are flowing, and the music is lively. Unfortunately they are mostly closed now, unless there is a very large crowd in. So come to Lavka for its magnificent riverside terraces, which prove popular with all age groups. During the day, it is a good spot to enjoy a quiet drink by the river. On a summer's evening, it is popular with Prague stag parties, hen nights, and a wide range of international visitors.